Lewis McGuigan played a starring role in Bexhill United's 2-0 win away to Southwick. Bexhill United Football Club achieved its fourth victory over Southwick this season with a 2-0 triumph on Saturday. 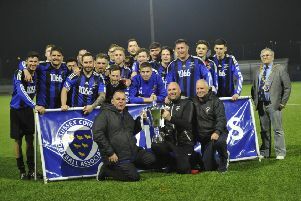 A goal in either half from Wayne Giles and Connor Robertson gave Bexhill a Macron Store Southern Combination League Division One double over their bottom-of-the-table hosts, in addition to a pair of cup success at Old Barn Way. It was a welcome win for Bexhill after three straight defeats at the end of a run of four games in eight days. The Pirates started quicker and Connor Robertson, who was causing problems on the right, put one shot over the crossbar and another into the side-netting. Craig Ottley struck the crossbar with an effort from midway inside Southwick’s half. Bexhill took the lead in the 44th minute. Wayne Giles got on the end of an intelligent throughball from Kyle Holden and made his way towards the corner of the six-yard box, from where he smashed a shot which hit the goalkeeper and rose into the roof of the net. The visitors were good value for their half time lead and although they didn’t boss the second half to the same extent they had the first period against a Southwick side which battled hard, goalkeeper Dan Rose didn’t really have a save to make. Giles had a good strike well saved and Lewis McGuigan had a couple of chances from corners before Bexhill grabbed an 89th minute second goal. Robertson came from nowhere to lunge in on the goalkeeper following a back pass and the ball ricocheted off him into the goal. “The most pleasing aspect was the clean sheet,” added Light, who felt McGuigan was Bexhill’s stand-out player on the day, saying ‘everything he did was immaculate’. Ryan Harffey gave a really assured performance in midfield. Nathan Lopez was stretchered off with a swollen ankle, Craig McFarlane played through the pain barrier as ever after hurting his shoulder and Corey Wheeler did very well after coming on despite a sore thigh. Bexhill: Rose; Rea, McGuigan, McFarlane, Ottley; Robertson, Holden, Harffey, Cuddington, Lopez (Wheeler); Giles (Robinson). Southern Combination League Division One top half (played-points): 1 LITTLE COMMON 32-82 (+73 goal difference), 2 Langney Wanderers 32-78 (+65), 3 Lingfield 31-70 (+57), 4 Ringmer 33-61 (+30), 5 BEXHILL UNITED 32-55 (+22), 6 Mile Oak 32-55 (+15), 7 Wick 31-54 (+29), 8 Hailsham Town 30-45 (+1), 9 Selsey 31-44 (+2). Bexhill will be back in action away to second-bottom Billingshurst tomorrow (Tuesday) night. Lopez and Jack McLean, who has picked up a recurrence of his knee injury, are out for the final two games of the season, Liam Foster is working, Georges Gouet is unavailable and Wheeler is rated 50-50, but Zack McEniry and Kenny Butchers should return.